If you are out of work and looking for trucking companies with high-paying trucking jobs, the task can be a real hassle. 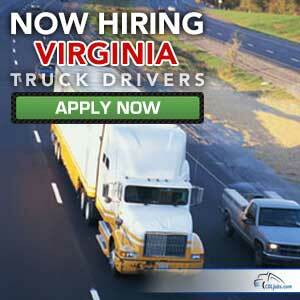 Looking for truck driver jobs in the state of Virginia is hard work, harder than hauling on the road. CDLjobs.com can help truck drivers take care of finding trucking jobs. We have company profiles and truck driver jobs posted for you to review. We offer all of our services completely free of charge to truckers. Our online application is easy and secure, waiting for you when you're ready to fill it out and submit it to the companies of your choice. We want you to succeed in your trucking career. Explore our website and find the best trucking companies in the industry. Get home EVERY WEEKEND with high paying truck driving jobs for Regional drivers at Hornady Transportation. Flatbed truck driving jobs with a trucking company who has been named one of the Best Trucking Companies to Drive For. Truck driving jobs with Diversified Transportation offer a good starting wage and great home time. Regional tanker jobs with Fort Transfer offer drivers an opportunity to earn the best driver pay! Be home on weekends with regional truck driving jobs from Gypsum Express and enjoy great truck driver pay! 94% satisfaction rate among current and former drivers! .50cpm, consistent, steady freight, late-model trucks, great benefits and we know how to treat our people with respect! Family owned and operated for 31 years – come be a part of our nearly 30 MILLION miles dispatched! High paying truck driving jobs with local, regional, and OTR truck driving positions. Earn more money with HMD Trucking. Earn great money with trucking jobs from MDS Trucking or start your own business with their winning lease purchase program and become an Owner Operator! Mail hauling truck driving jobs pay by the hour and get you home! Check out Salmon Companies! Truck driving jobs for truckers with traditional family values. Come work with Summitt Trucking and enjoy your family! Dedicated truck driving jobs with weekly home time or OTR trucking jobs with bi-weekly home time. Great money and benefits with Transco! Join a 100% Owner Operator trucking company and never fight for freight with company trucks!